How high feeder pole should be? The height of bird feeder pole is truly important thing to take into consideration for your anti-squirrel strategy. The point is simple: the squirrels should not be able to reach the feeder by jumping straight up from the ground. But the question is how high can a squirrel jump? By summing up the experiences from numbers of bird feeders owners, I have found out that the most gifted squirrels can jump up to 4.5 feet vertically, meaning that the bottom of your bird feeder should be somewhat above that level. Just kidding... 10 foot bird feeder poles are actually deer proof solution. "Kettle Moraine four arm bird feeder pole" looks pretty much like coat hanger in Victorian style. But in fact, it is highly decorative heavy duty bird feeder pole made of steel. The surface of the pole is protected by black powder coating in order to withstand harsh weather conditions. The pole is 8 foot high, while the pole diameter is 1 inch and that's what makes Kettle Moraine compatible with the most of the anti-squirrel baffles in the market. Kettle Moraine is in the group of the tallest bird feeder poles in the market, but it is not the tallest. If you are after even taller pole for some reason, please check 10 foot bird feeder pole further bellow in this article. Aside from stylish looks and durability, this feeder pole features another great things: it can accommodate up to four bird feeders with total of 30 pounds of bird seed. The feeder is also easy to install due to twister ground socket that drives the pole 20 inces into the ground. And in the end, the most important thing: this pole comes with the anti-squirrel baffle and the overall opinion from previous customers is that the pole is squirrel proof indeed. 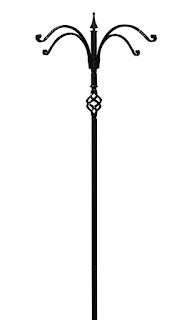 For current price of Kettle Moraine 8 foot bird feeder pole please check this Amazon link. 10 foot bird feeder poles are not exclusively anti-squirrel devices because their primary focus is to keep your feeder out of the reach of the deers. However, there are some great examples of 10 foot deer proof bird feeder poles equipped with anti-squirrel and anti-raccoon baffle, so if your bird feeder gets visited by the intruders bigger than the squirrels, I suggest you should visit the link and read the reviews there. Always remember that proper placement of your bird feeder pole is single most important thing you should pay attention to! To learn how to choose the best placement for your bird feeder pole please check my article Why squirrel proof bird feeder poles are so important. There you'll find plenty of useful info on pole baffles as well which is also one of the key factors in squirrel proofing bird feeder poles.